This resource is an all in one worship companion designed for those who do not follow the lectionary, or would like an alternative to the lectionary during Lent. This new volume in the Feasting on the Word series will serve as an all-in-one pastor's companion for Lent and Holy Week, providing worship materials and sermon preparation tools for both lectionary and nonlectionary preachers. The resources in this companion are a combination of material from existing Feasting on the Word volumes as well as newly written material. 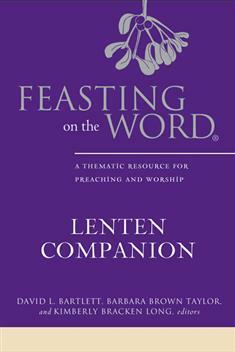 In keeping with other Feasting on the Word resources, the Lenten Companion offers pastors focused resources for sermon preparation along with ready-to-use liturgies for a complete order of worship. A complete order of service is provided for each of the Sundays in Lent, plus Holy Thursday, Good Friday, Holy Saturday, and Easter Sunday. Hymn suggestions, midweek services, and children's sermon suggestions make this an invaluable resource for the season of Lent.